About a Tree: could elf ‘n safety please leave the building?! There has always been collective fear. At some profound inner level, we know as human beings just how fragile we are, very temporary tiny blips of matter clinging to a small speck of planetary gravel hurtling through space/time at vast velocity. We spend a lot of time, energy and sheer ingenuity setting up an intricate variety of personal and social defences to shield us from this fact. But we are still prone to outbreaks of mass panic. Does anyone remember the Millennium Bug against which it cost millions of dollars world-wide to protect ourselves? I seem to recall that a Hong Kong taxi driver’s meter going slightly wonky at midnight on the dreaded day was about the stretch of it…. Now we have Swine Flu. The UK populace, to offer one small global example, is being whipped into a frenzied lather over an infection which, so far, we are told kills no more people than average winter flu which has been around for a very long time.It may in time turn out to be very serious indeed. It may not. In the meantime, could we all please calm down? The apparently increasing tendency to panic, over-react and attempt to protect ourselves from any imaginable risk, great or small, reminded me of an upsetting incident which occurred in our neighbourhood four years ago. I wrote an impassioned article about it at the time, and thought it might be timeous to publish it here, as a reminder that we badly need collectively to try and find a way of getting a grip!!! Restoring an appropriate sense of proportion regarding what constitutes real danger, and what does not, appears to be increasingly required. I hope you enjoy this piece, and that it will strike a chord with a few readers…. ” Not always. We knew what we had. Now it’s gone. Well, no….we have been left its remains as a perpetual reminder. Ten sturdy feet of mature trunk, a shocking, new slash. Then nothing. Our fabulous beech tree, probably planted when Napoleon was our national enemy, is no more. Seventy five feet, one hundred and fifty years. Home to owls, crows, jays, pigeons, sparrows, robins, squirrels, insects innumerable. Marker of the four seasons, slow to leaf in spring. Last year, I began to note the date in May of its first greening. Overlooking a city river, and one of the public parks for which the city of Glasgow is famed as ‘the dear green place’, we live three floors up – opposite the beech tree. It stood centred in our vision from the oriel window of the front room. We liked watching the sunset filter through its wide spread branches and plentiful leaves. Insomniac often in the pre-dawn, I used to stand drinking a comforting cup of tea, watching the slow morning light reveal the beech in all its familiar detail, and listening to its very own dawn chorus. Happy, I’ve gazed at the tree. Sad, grieved, I have been comforted by its steadfast presence. It has always restored perspective to know that the beech tree was witness to the joys and sorrows of many predecessors, in this hundred and ten year old building which has been our home for the last twenty years. Nature anchors and balances all of us. It gives us our life and absorbs our death. It reminds us that there is an immutable cycle of birth, growth, maturity, decline, death and rebirth; we share that with galaxies and gnats alike. To city dwellers, green spaces and the trees that dwell in them are vital though unseen supporters of health and well-being of mind, body and spirit. This Spring, we found out how much the old beech tree meant to many of our neighbours. I was not the only one standing at a window or on the street in tears, watching its protracted and unseemly destruction. Ours was one of many households who phoned with questions, anger, grief and challenge. We were given only one day’s notice that tree clearing would be taking place on our street – could we please park our cars elsewhere for 13th and 14th April? We were not consulted. None of us imagined that the “tree clearing” would include the felling of an old, mildly diseased (as we all are, over the age of fifty !) but still beautiful, substantial and much admired tree. What sort of society have we become? Had our local community, via the Community Council, been consulted; had the explanations and reassurances, provided in extremis to individual households after the event, been given in advance; had apologies been offered for distress caused; then the loss of our tree might have been easier to bear. There are times when one “small” incident illuminates the values of the whole culture within which it occurs. The “small incident” of the destruction of our local tree illuminated two strands in our current social weave with stark clarity. One, failure in bureaucratic decision-making to quantify the positive physical, emotional and spiritual impact of the natural world on the humans and other creatures who are embedded in it, in both local, national and global management of our Earth. Two, failure by organisations and their personnel to treat their fellow human beings on whose behalf they are operating with respect and courtesy. Unpopular decisions have to be made at every level, everywhere. Society could not function otherwise.These decisions can be right, wrong, or equivocal. But they could be presented with care and courtesy within a context of adequate consultation. The opposite is the norm. I won’t trouble the reader with all the details of the explanation we were given. No doubt the decision to chop down our tree was right, wrong or equivocal depending on the lens through which one views it. But there is one element worth singling out which, once again, illuminates the bigger picture. The tree was described as “a danger”. A branch, weakened eventually by disease, might fall off and hit someone. A flash flood might weaken the roots, causing the tree to crash down on the walkway below. For heaven’s sake, what is wrong with us? Western society is currently losing its sense of proportion as it sinks into ease, comfort, convenience – and avoidance of risk of any kind. We need to stop distracting ourselves by projecting our underlying collective fear of the consequences of what we are doing to our planet, onto the ubiquitous, ordinary risks which have always threatened us all in every second by the very fact that we are alive. Instead, we could turn our civic energies to the local task in our small nation of improving Scotland’s abysmal record on recycling, and the global task of consuming less fossil fuel. I feel confident that I am not the only person who views, with growing horror, the present tendency to consume civic energy and money performing increasingly ridiculous pre-emptive strikes on imagined risks which might be sue-able. Every time we look out of our third floor window at the large chunk of empty sky where the ghost of our tree still hangs, we feel a pang of impotent anger and sadness. In time this will fade – but the truncated corpse which the Parks Department elected to leave (” to promote bio-diversity”….!! ), remains as an eloquent reminder that our neighbourhood has been diminished. The destruction of our much loved local beech tree may well add to a sense of alienation from the natural world, and feelings of impotence and apathy in the face of bureaucracies whose judgements of what is important to human beings are narrow and shallow. On the other hand, it may have the opposite effect, making us more aware than before of the importance of the natural environment, and more determined that this local area will not be ‘managed’ without our involvement. This entry was posted in Healing - the power of Nature (article archive) and tagged 'tree clearing', beech tree, Community Council, elf 'n safety, fossil fuel, Glasgow 'the dear green place', green spaces, health and well-being, immutable cycle of death and rebirth, Joni Mitchell ‘Big Yellow Taxi’, Millennium Bug, recycling, risk-averse culture, space/time, Swine Flu. Bookmark the permalink. That was some chord, the echoes are still reverberating so thank you for sharing your experience. Anne, I live in a stand of oak trees near Sacramento, CA–called The City of Trees. I love trees with a passion and their grounding energy. I love your blog and have added it to my roll, Other Cool Star Stops, on The Radical Virgo. Thanks so much Joyce – it feels good to be in touch with you and with your insightful writing. I will add your blog too – when I can sort an annoying tech problem preventing my adding links at the moment. A few days ago I read an inspiring post on how a whole community in the USA came together to save a beloved local tree. 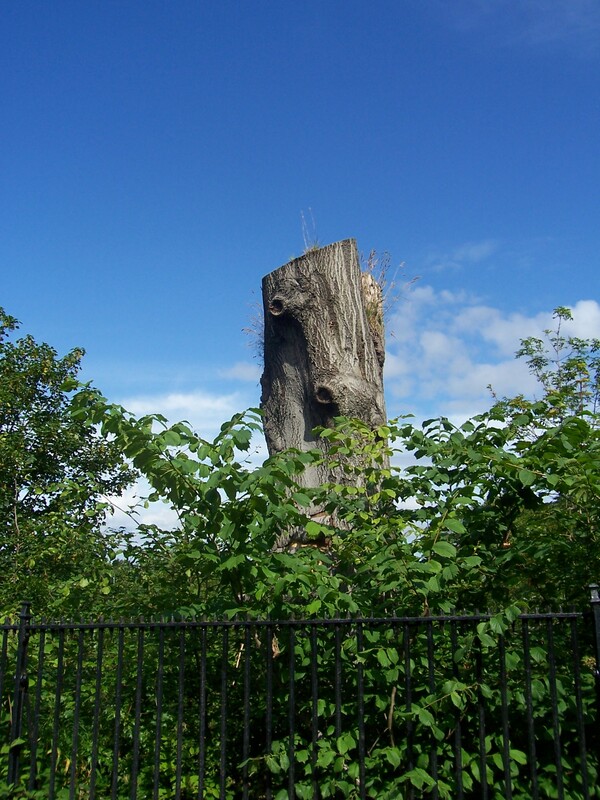 I thought I’d add the link as a counterpoint to this post which I wrote following my local community’s dismal experience some time ago, when our favourite tree was surreptitiously cut down without our being given enough notice to do anything to save it. The post comes from one of my favourite blogs, Linda Leinem’s The Task in Hand. You will be uplifted by the post, and by the blog! Anne, Thanks so much for pointing me to this post. I can feel all of the same emotions you and your neighbors must have felt over the unexpected loss of that beautiful old Beech tree. I can also feel the love and appreciation you had for it too. Unfortunately, hasty decisions made by those in official positions is all too common. Thanks so much for your comments on my most recent post, too. It is comforting to know that even across oceans and continents we are connected by our special bond with trees. And thanks to you, Bookpeeps! I may well edit and republish this post since, as you may have read, several species of our native trees here in the UK are under threat from various non-indigenous tree diseases. I have just heard a wonderful UK Radio 4 programme on the healing power of trees in which ‘Gossip from the Forest’ by Sarah Maitland was mentioned. She is SUCH a good writer – deep, erudite, perceptive – that I am letting you know about it before I even go over to Amazon to check it out! A definite Xmas present for me from my fellow bookophile, nephew Daniel, I think! I’ve now asked for a copy for Xmas…it looks just the thing to be reading at the Winter Solstice.